How large or small is your backyard? Do you want a space for many people or just a few? Do you want a permanent structure? Do you want protection from the rain? Do you live in an area that receives strong winds? If your backyard is large, you can have many more choices in the planning of your outdoor structures. In fact, your choices in design are only limited to any regulations set out by your cities bylaws. If your backyard is small, then you will need to be a little more creative when it comes to choosing the correct outdoor structure for your situation. When deciding on an outdoor structure, you will need to think about the purpose of the structure. For example, if you want a design that will facilitate entertaining guests outdoors, then you will want something large enough to accommodate all of them. Many people choose to have this area close to the house for easier access when serving drinks or food. 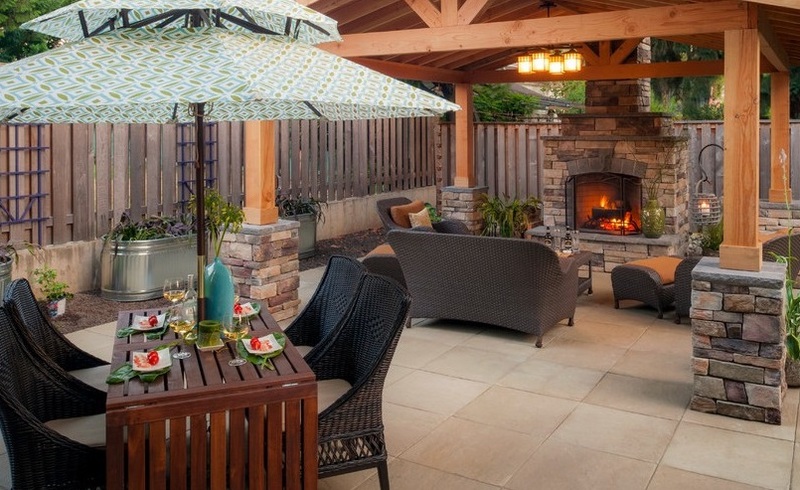 Usually people prefer to have outdoor decks built right outside of a patio door. This extends the living space from inside to outside in a very natural flow. A permanent structure, such as the deck we just mentioned, will usually require a permit. Check with your city to find out which type of structure will require a permit. Generally speaking, any structure that has a permanent foundation, such as a shed, or anything that is attached to a building, such as your house is considered a permanent structure. A temporary structure is something that is only used for a season and then taken down and put away. These would include such things as pop-up shelters, tents, sail shades etc. Whichever structure you choose, it must be able to withstand the elements. If you get a lot of wind or rain, then a sail shade would not be a good option for you because the water would collect in the sail and leak through or wind will make it billow too much. For an environment such as this, a gazebo or deck would be a better choice. If you have a very sunny backyard, you will probably want to have some type of covering to keep the area from getting too hot. You may want to think about adding a roof to your deck, if you have one, or use something more temporary such as large umbrellas or pop-up tents. If you want to install a pergola, you might consider adding some lattice to the top to provide a little shade. A wooden gazebo is a more permanent structure and has its own domed roof, and if you buy a tent-like gazebo that can be taken down and moved around, this will also give you shade at an affordable price. Whatever you choose will depend on your budget. Here is a list of options entered in the order of the highest price to the lowest price, generally speaking. You also need to consider what type of material you want to put on the ground. Between sod, bark mulch, or gravel, ensuring you have a firm base to build or grow on is key to a beautiful backyard space. Once you have taken stock of the many options available and weighed the pros and cons, all that you must do next is to install the outdoor structure that will fit your needs, your taste and budget.